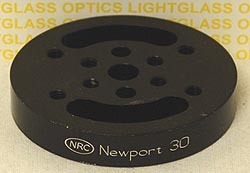 The Newport 30 Rotary Adapter attaches to posts, stages, and other components to allow coarse rotation on the breadboard or optical table. Made of Black Anodized aluminum, this adapter can be rotated over 50 degrees. There are 6 drilled and tapped holes on the face which accept standard Newport spacing.